There are a number of reasons why a child might not be able to put their ears in the water. These might include having an ear infection or having Grommets. There are also a number of hearing impaired children who participate in lessons here at Splash-A-Bout Swim School. We believe that no child should miss out on learning an important life saving skill. There are a number of ways we can modify our lessons to cater for these children. For example, we can speak slow and clear, or use hand gestures to explain what to do. We can also use special sign cards that show the child what to do in picture form. 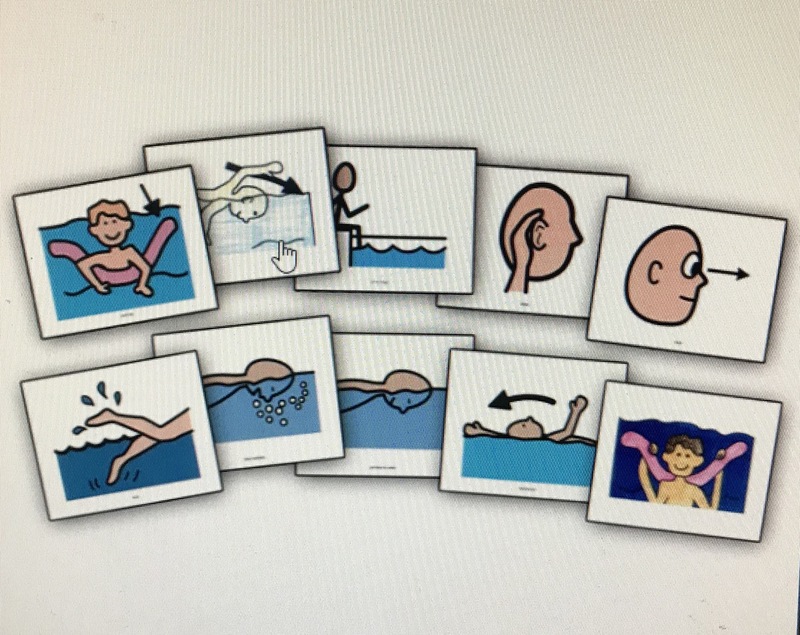 Examples of picture cards we can use to explain activities. If your child has Grommets or is susceptible to ear infections, there is a way to prevent water from getting into their ears. The combination of ear plugs/ear putty, an ear band, and a swimming cap will allow them to put their head in the water, without the hassle of water in their ears. We have these items available at our swim shop, so if you require them, come and see our friendly staff. Don’t forget to send in your questions if you have any! To send in a question, get in touch with us via our Facebook page or email. You can also ask one of our friendly staff members for advice. For more articles like this one, pop on over to our News and Facebook pages.